Der Artikel Gioacchino Rossini (1792-1868): Il Signor Bruschino wurde in den Warenkorb gelegt. 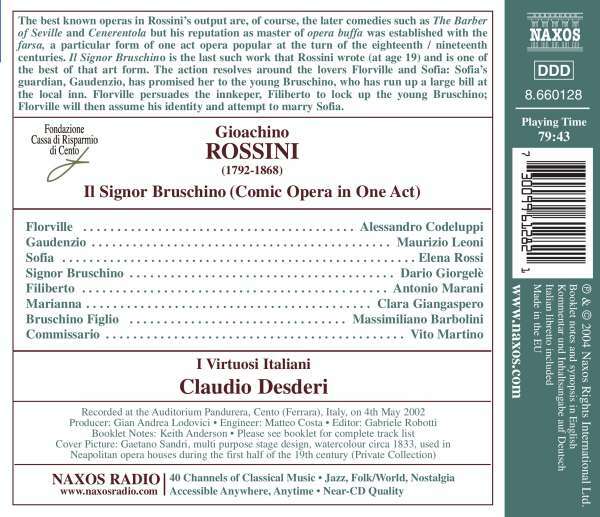 The best known operas in Rossini's output are, of course, the later comedies such as The Barber of Seville and Cenerentola but his reputation as master of opera buffa was established with the farsa, a particular form of one act opera popular at the turn of the eighteenth / nineteenth centuries. 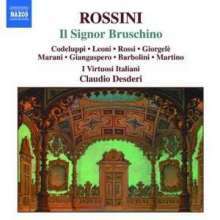 Il Signor Bruschino is the last such work that Rossini wrote (at age 19) and is one of the best of that art form. The action resolves around the lovers Florville and Sofia: Sofia's guardian, Gaudenzio, has promised her to the young Bruschino, who has run up a large bill at the local inn. Florville persuades the innkeper, Filiberto to lock up the young Bruschino; Florville will then assume his identity and attempt to marry Sofia. Stereo 10 / 04: "Die leichtfüßig rhythmisierte Eleganz, mit der Claudio Desderi und die elanvoll begleitenden I Virtuosi Italiani durch das Verwirrspiel wirbeln, macht das buffoneske Spielchen richtig hörenswert."